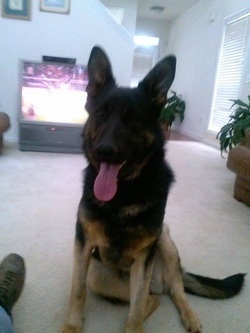 I just wanted to write a recommendation to let anybody who is interested in purchasing a top quality working German Shepherd, they need look no further than Caine de Lup. I am not new to working line German Shepherds and have had them most of my life. Although I no longer compete, I still appreciate a quality dog and train for personal purposes. I have purchased two puppies from Caine de Lup, buying a third, and can attest that Alex takes great care of his pups. The puppies arrived in great health and I have had no health issues with any of them. Alex was very careful in selecting a puppy to match my needs on each occasion when I purchased from him. He knows his dogs well, patiently listens to, and considers, the wants of his customers and carefully matches the pups with the buyer's needs. He is just as committed to placing his pups in the right home as he is in making sure that the homes are the right place for his pups. The puppies I purchased have confidence, high drives, high energy levels, stable, athletic, environmentally sound, very clear headed, dominant, balanced and are eager to please, not to mention they have very nice conformation. If that is not enough, the pedigrees on his dogs are highly sought after and the matings were well thought out and carefully matched with a goal in mind committed to producing the best of working dogs. To add to the package, Alex is always happy to assist with any questions and offer support. He wants to see his customers and their new puppies succeed. On the transaction side, Alex was professional, knowledgeable, and facilitated the entire process. It was a pleasure doing business with him and I could not have asked for more. After all my years in dogs, I can honestly say that I will look no further than Caine de Lup for all my future needs in German Shepherds. We purchased Cesko from Caine De Lup. After owning two female GSD’s, we decided to purchase a male this time. Alex, is very knowledgeable and answered all my questions. He has continues to be a great resource even now, a year later. He really cares about his dogs and the breed and it shows in the quality of pups he produces. I get comments every time I take Cesko out in public regarding his beautiful coat, his piercing eyes, and overall smartness. He is very trainable. He has both high food and prey drive making him very energetic and a lot of dog. He has proven himself both in obedience and protection work. Cesko is truly courageous with a great temperament. I swear he isn’t afraid of anything, including gun fire. I recommend Caine De Lup to anyone that loves working dogs or the GSD. I just wanted to send a huge “THANK YOU!” for my beautiful girl, Sascha von Caine De Lup! years old on March 11, 2017.
responsible breeder that was active with Schutzhund/IPO training and had excellent testimonials. Michigan to Georgia when she was of age to come home. gorgeous, have wonderful confirmations, are sound and level headed, and well taken care of. Lup apart from the rest! work with as my partner and best friend! I highly endorse Alex and Kristina of Caine De Lup! I proudly recommend Alex and his family for the outstanding customer service they provide at Caine De Lup, Breeeders of working line German Shepherd Dogs. It is not only the amazing K-9's they produce or import it is Alex's dedication to the clients he services. 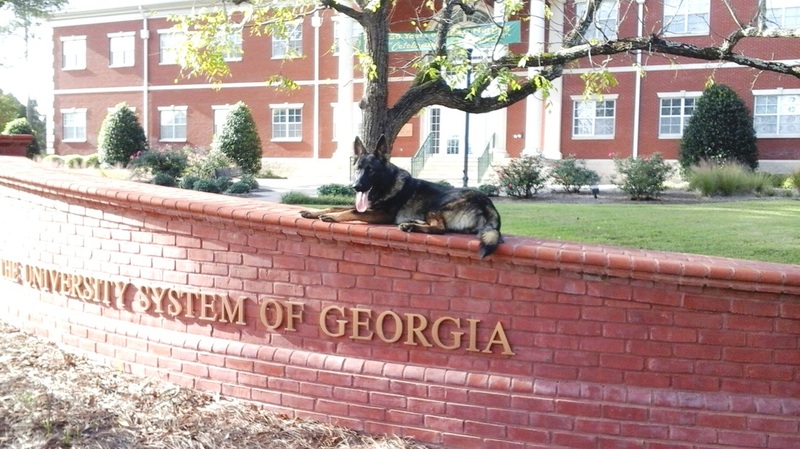 He is a tremendous resource for these working line GSD's and takes his experience and knowledge and time to match each of his clients to the correct K-9 they are searching for as a new edition to their family. Being a family man himself and a Law Enforcement Officer he still finds the time to answer even the most trivial of questions and follows up on his clients and the K-9's well after they are purchased or imported from his breeding program. I travel 7 hours from my home in Florida to his home in Georgia and in the distance between us there must be a dozen breeders, but it is his devotion to his clients needs and superior quality dogs that sets him apart from the other breeders and trainers. I've purchased two K-9's from Alex at Caine De Lup and I am as confident of these dogs as I am of him. If you are searching for a working line GSD give Caine De Lup a look and enjoy your new edition. We met Alex and his wife Kristina almost two years ago when we were looking for a quality German Shepherd. When I spoke with Alex over the phone about a solid black male that he was importing, he answered all of our questions. We could tell from that very second, he was very knowledgeable about the breed and enjoyed what he was doing. We agreed to purchase Wrath and met Alex and Kristina at the airport. They handled all the paperwork and they were very nice to deal with. Alex called to check on Wrath a day or two later and has kept in contact with us every since then. Alex deals only with the highest quality German Shepherds and we have been fortunate enough to receive a total of four from him. Wrath earned his CGC; obtained a Champion title in UKC, and an Intercontinental Puppy Champion title with all SG ratings by the time he was 7 months old. He was ranked as high as number 7 on the UKC standings this year amongst all German Shepherds in UKC. Our other females are young right now but are showing a lot of promise to be super stars in what ever we ask them to do. I cannot say anything but good things for Alex, Kristina, and their line of Top Quality German Shepherds. I would not hesitate to purchase another puppy from him. It is refreshing to find a breeder with morals and ethics that only wants to better the breed and wants to place their puppies in a home that works best for both the puppy and owner. 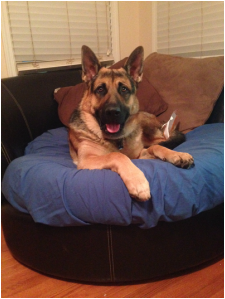 I would recommend Alex and his kennels to anyone looking for a quality German Shepherd. I cannot thank you enough for such an amazing awesome working dog! When I came to you, I had looked within the USA and abroad and was just not finding exactly what I wanted for different reasons. When I contacted you, I knew what I wanted, explained every detail to you, and you had the absolute PERFECT pup for me, who is proving to be everything I wanted and more!!! You have fantastic bloodlines and the proof is in the progeny you produce!! Outstanding! My pup, Mafia, is everything I want & need! She’s very protective, has solid confirmation, fantastic drives for the training I have her in (personal protection / psa) and her capacity for learning is endless!! She’s one of the most athletic and agile dogs I’ve ever had! She’s a one owner type of girl, tolerates others when told they are a friend, but will stand guard and protect her own fearlessly, until you tell her to stand down. She can be a VERY serious dog (which was what I wanted), but also settles down very nicely, which also was definitely on my list! When she’s in the house, she is loving, affectionate and is great with my other German Shepherds and my Shih-Tzu! She has such a willingness to please her handler and endless energy to work! I am beyond happy and ecstatic to have such an incredible dog! Alex, working with you to find the right puppy to suit my needs, along with the final steps in purchasing her, were seamless! Your character, honesty and integrity throughout this entire process speak VOLUMES!! (That’s extremely hard to find in the dog world). You are awesome to deal with and I highly recommend anyone who wants a fantastic pup, to come to you! Not once, did you ever try to up-sell or hype up your dogs to be something more or less. You never had to, because they speak for themselves. If anyone is ever interested in getting a puppy, I HIGHLY recommend coming to you. You will make sure they get what they want, whether it’s Border Patrol, Police K9s, Personal Protection dogs, or a wonderful house pet! I truly could not be happier! Mafia is by far, everything you said she would be and more! Thank you so much for my dream dog! I work in the oil field so I was looking for a buddy to keep me company while I'm away on the road. I have spoken to Alex multiple times, pretty much everyday asking questions and he was always there to answer any questions I had. He had a litter available and I was looking for a family/ protection dark sable male and he had one. I quickly reserved it and let me tell you, I will not hesitate to buy from his kennel again. He is what I was looking for. He listened to my needs for the type of dog I was looking for and I'm very happy to have purchased Zeus from Alex. 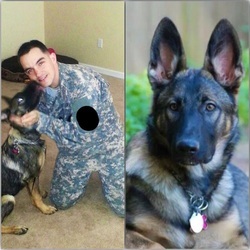 Hello my name is Joe, I purchased my dog Maverick from the Vancea family back in May of 2013. And I couldn't be more thankful and happy! I took maverick home at 8 weeks old at 15lbs. It was very evident that he had been taken care of very well. All of his shots were up to date and documented. All documentation was provided for the championship blood line of the pedigree. I had just recently had my dogs hips Xrayed for OFA evaluation; there was zero bone deformation. So the hips from this blood line are great and shouldn't be a concern. At 10 months old my dog maverick weighs 115lbs 28inches tall at the shoulders. Also his temperament is excellent, he is also extremely loyal and obedient! These dogs are willing to please and incredibly easy to train. My puppy was fully house trained in the first week I had him. Now he rings a bell to go out side. All this is a testimant to the superior breeding and blood line; also the professionalism taken into breeding these animals. If your in the market for a German Shepard I would highly recommend the vancea's. Very resonable pricing for a champion pedigree! And I could not be happier! We discovered Char's litter online in December of 2013 and knew immediately that one of them was going to be the one for our family. Every puppy looked very healthy and their ears were perking up a bit at 8 weeks! We drove fifteen hours round-trip to find the puppy that was right for us and boy did we find him. Char was very perky and exceptionally independent for his age; he seemed to have a strong will and the other pups loved to follow him around. These traits as well as his beautiful and unique coloring were more than enough for us to take him home. Now, exactly five months since he was born, Char is an amazing young GSD. He loves to go on walks and play with our family, including the cats and the older dog. 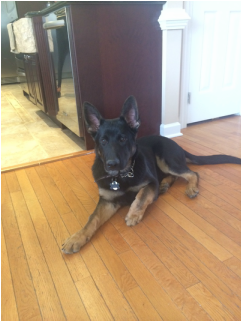 Char is learning very well with his training and is growing into the great family dog that we always wanted. But most of all, he is one of the most loving and loyal pups that I've ever had the pleasure of raising. We look forward to the many years that we will have with our little ball of fun! Working with Alex was easy and professional. All necessary paperwork was in order and the dog(Winston) was as advertised. Almost immediately after getting him home Winston inserted himself into our family as one of our own. His natural protective instincts are visible on a daily basis as he stays near our 3 young children and always has them in his sight. Winston is playful, energetic, protective and beautiful. Everywhere I go I receive compliments about his stature and his character. I will definitely be returning to Alex for any future Shepard's. Hello, I am Lisa the owner of Shadow. I got Shadow, he actually slept in the bed with me that night and would wake me up to take him outside. Although I really didn't sleep that well the first night because I was so excited to have been able to get Shadow. I would get up every morning before work and go out and play ball with him and walk him on his leash around the yard. Shadow is an amazing dog. He is very smart and very protective of me. He even follows me with his ball in his mouth while I ride the mower cutting the lawn. He does get along very well with my Lab but he can be jealous if he isn't getting the same attention. I absolutely love this dog and since I do not have kids he is my boy. He is very much part of our family. Shadow had all his shots when I received him. Allen even gave me all the information on Shadows parents and the AKC registration papers. If you are ever in search of a German Shepherd I highly recommend this breeder. Allen Keen as a trustworthy and caring breeder. I am looking forward to many more years with my boy Shadow. 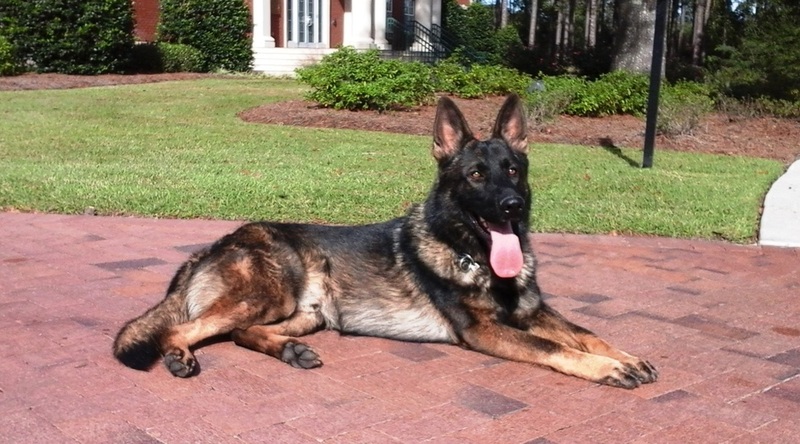 We visited Caine de lup in December 2013 because we were looking for the right german shepherd. The kennels were well-maintained and all the dogs seemed happy and well taken care of, but Neo stood out to us so we decided to take him home and he's been a wonderful addition to our family. What stood out about Neo was his sable color and his personality that shined through even as a puppy. Neo adjusted quickly to life with us and immediately formed a bond with our yorkie terrier. We also quickly discovered how smart he was when we began training him, it was like second nature to him. We love our german shepherd Neo, he's grown into such a great dog and we owe it all to Caine de lup kennels. I received my puppy when he was 8 weeks old from, Alex and Kristina. He was so cute! Had the biggest feet! Very playful! We immediately started a training regimen. He is so smart. Within two weeks, he'd learned to kennel himself up! To sit! He's now 10 months old and weighs 85 lbs! I have always had him around other dogs and people. He has a great disposition. Thank you Alex and Kristina for a wonderful addition to our family!